Want to learn Minecraft? You may need some help. Connected Learning.tv’s month-long series about Minecraft in Education is mixing the usual insightful Google Hangout discussions with in-game sessions during which educators play Minecraft. Last Tuesday evening educators played inside Temple University’s Minecraftedu server in the first of three opportunities this month to attend playful professional learning in the blocky biomes of the wildly popular sandbox game. Midway through the first in-game session I could be found hanging out in a tunnel underground, where I’d taken cover in the hopes of surviving until daybreak. Just a few meters above me, other teachers who’d joined Temple’s server were starving, being murdered by zombies, or both. Any attempt on my part to save them would have risked the important materials I’d already gathered: a few raw pork chops, an iron pickaxe, and precious coal, which would help me light my way underground and also cook my dinner. I’d lost my partner Jon earlier in the day when, during our collaborative effort to gather wood for everyone, he walked into a pit and died. Isolation in the forest was my prize for Minecraft competence and now, like a mole, I tunnelled underground out of habit and innate industriousness. As I dug, I spoke with the folks from Temple who set up the server. We used Mumble, open source voice chat software, to discuss Minecraft in education and the goals for the Temple server. They plan to have different teachers showcase their Minecraft maps on the server and allow teachers to experience gameplay in order to better envision how the game might fit in schools. We paused our conversations about teaching and learning to occasionally discuss the fate of the teachers who were dropping like flies in the harsh Minecraft night. 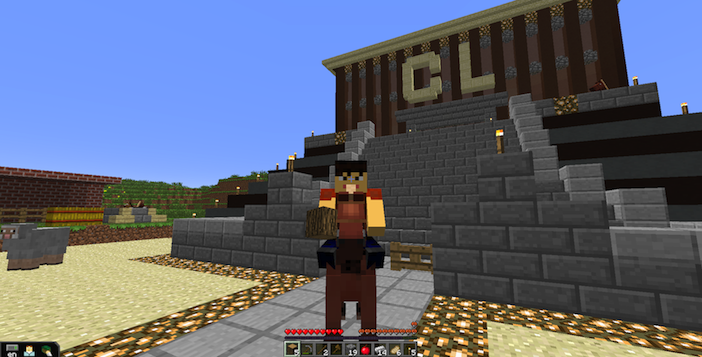 My Avatar on horseback in Temple University’s Minecraft server. These teachers new to Minecraft were learning that surviving overnight in “survival mode” is challenging. Rewind-and-replay-that-YouTube-tutorial challenging. Go-back-and-reread-the-Minecraft wiki challenging. When I first played the game about a year ago, it probably took me a day and a half (Earth time) to gain the competence to do it. Though newcomers to Minecraft may find themselves alone in the digital wild, no one learns to play Minecraft alone. The game requires networked learning, and players getting started rely heavily on the digital supports created by other gamers who film tutorials or edit and update the wiki, presumably because this type of digital composition is engaging and rewarding. 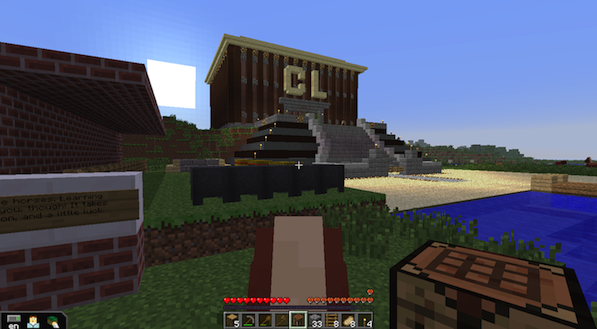 The informal research kids do to get up to speed in Minecraft first drew me to the game. Never much of a gamer myself, I was fascinated overhearing a boy at the Denver Writing Project’s Young Writer’s Camp describe how he had scoured YouTube and read extensively on the Minecraft wiki so that he would know how to survive and build in the game before her ever started. Listening to him explain how he’d pursued competency, I knew he’d done a kind of research that probably isn’t taught much in schools- a kind of research where credible sources are other kids with gaming skills, YouTube channels and screencasting chops. Intrigued by the type of informal, interest-driven research, I committed to figuring out the game myself by following a similar research process. Now, a year later, I’ve logged more than my share of hours in the game with my daughter, who’s in second grade. I’ve led several short, laughter-filled design challenges for middle school girls in my district and a 4-day survival campaign with high school boys during which we edited the Minecraft wiki and filmed tutorials and walkthroughs in our virtual camp. I’ve come to see the game as a platform for collaborative learning and digital composition. For educators interested in learning more about Minecraft, this Tuesday’s in-game session will have us back in Temple University’s Minecraftedu server. I think the plan is to engage in a group build. That could be anything really… a house, a rollercoaster, or the Notre Dame Cathedral. If you join, be sure to grab an experienced partner. ConnectedLearning.tv’s series promises to connect educators innovating with Minecraft with those who hope to learn more about the game. It figures to be a rich example of teachers teaching teachers. If you just need to learn to survive the night in Minecraft, though, you’ll probably need to watch a tutorial filmed by a kid.